(August 30, 2018) - A former defensive standout turned running back and several new import players provided the highlights of week 1 in the X League. 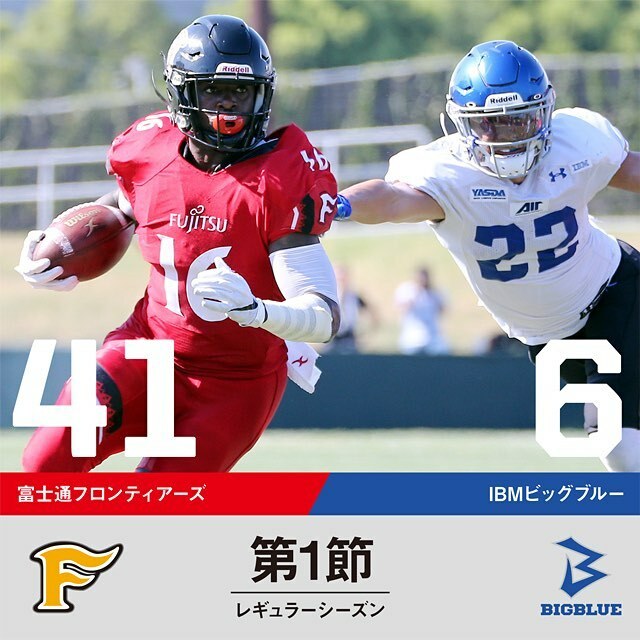 Trashaun Nixon, an All X League linebacker the past two seasons, ran for 214 yards and the first three touchdowns of his team as the Fujitsu Frontiers routed the IBM BigBlue 41-6 in a rematch of last year's Japan X Bowl. The defending X League and japanese champion lost QB Colby Cameron and RB Gino Gordon but did not miss a beat thanks to Nixon's switch to the offense and new quarterback Michael Birdsong, a product of Marshall University, who ran for 29 yards and threw a 34-yard touchdown pass to WR Teruaki Clark Nakamura. Next up for the Frontiers is the Asahi Beer Silver Star, a 20-8 winner against the Dentsu Club Caterpillars in the opening game of the season. In the central division the Nojima Sagamihara Rise celebrated a 24-7 win in a key Super 9 game against the LIXIL Deers. In that game new US import quarterback Jimmy Laughlea, replacing last year's All X League performer Devin Gardner, threw for one touchdown for a 21-7 lead in the third quarter and opened the scoring with a 10-yard touchdown run in the first quarter. Meanwhile Nojima's defense held the offense of the Deers to just 197 total yards. 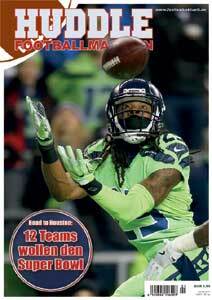 On September 2 the Rise will face the Obic Seagulls, a 90-3 winner against a totally overmatched Bulls Football Club. Even in defeat some new players from the US had noteworthy performances. QB Cody Sokol (Louisiana Tech) and WR Anas Hasic (West Florida) provided most of the offense for the Elecom Kobe Finies in a 21-14 loss against West Division favourite Panasonic Impulse. Hasic, who fnished the game with nine catches, scored both touchdowns for the Finies on passes by Sokol for a 14-10 lead at halftime. Panasonic avoided the upset with a 5-yard touchdown run by QB Benjamin Anderson and a succesful two-point conversion early in the fourth quarter. (August 13, 2018) - Defending X League and japanese champion Fujitsu Frontiers will get a heavy dose of what’s ahead this fall season early. In week 1 (August 25 through 27) the winner of three of the last four national championships opens the 2018 season with a game against IBM BigBlue - a rematch of last year’s Japan X Bowl. Last December the Frontiers crushed the BigBlue 63-23. This time a much closer score is likely since the Frontiers lost two key players on offense - QB Colby Cameron and RB Gino Gordon - to retirement. And things will not get easier for the Frontiers later during the group stage as they play arguably the second most challenging program in the Super 9. The Frontiers will face two more championship contenders, Panasonic Impulse and the Obic Seagulls, and the Nojima Sagamihara Rise. Only the Asahi Beer Silver Star’s program seems to be tougher with games against the Frontiers, the BigBlue, Panasonic Impulse and the LIXIL Deers. The group stage concludes on the final weekend in October. The top eight teams of the Super 9 qualify for the playoffs with the 7th and 8th place teams having to play wild card games against the top two Battle 9 teams on November 4. The quarterfinals are scheduled for Novemer 10 and 11, the semifinals for November 25 and the Japan X Bowl for December 17. The Japan X Bowl winner will play the College Champion for the national championship on January 3, 2019. (August 13, 2018) - The 2018 season in japanese college football will be played without last year’s champion Nihon University Phoenix. The KCFA suspended the team until the end of the year. All seven originally scheduled regular season games will count as losses and therefore the Phoenix will be automatically demoted to the first division’s second tier, the Big 8, for the 2019 season. 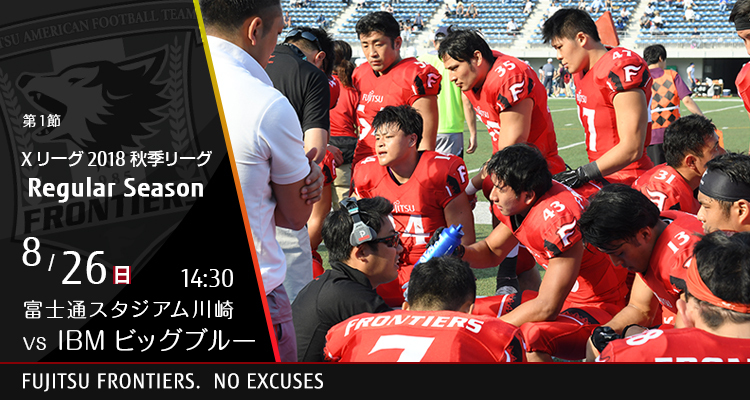 The suspension is the result of an ugly incident during this year’s edition of the annual exhibition game between the two most succesful teams in japanese college football on May 6 at Tokyo’s Amino Vital Field. In that game Nihon’s DE Taisuke Miyagawa injured QB Kosei Okuno from the Kwansei Gakuin University Fighters with a vicious late hit early in the game. Miyagawa later committed two more personal fouls and was suspended from the game. Shortly after the game rumours came up that Miyagawa’s illegal attacks were ordered by the Phoenix coaches. During a press conference on May 22 Miyagawa explained in detail how the coaches pressured him to try to knock the Fighters’ quarterback out of the game. At the end of July an independent committee that investigated the incident ruled that Miyagawa’s illegal tackles were indeed ordered by the coaches. As a result the KCFA upheld the suspension of the team issued in late May as well as lifelong bans from football activities in the Kanto region for Head Coach Masato Uchida and one of his assistants, Tsutomu Inoue. Both were fired by Nihon University immediately after the report was submitted to the university. More Sports section of The Japan Times Online.